Douglass becomes a recruiter for the 54th Massachusetts Infantry, the first regiment of African-American soldiers; his sons Lewis and Charles join the regiment. Eventually his son Frederick Douglass Jr. becomes an army recruiter also. About 180,000 African Americans serve in the Civil War on the Union side. 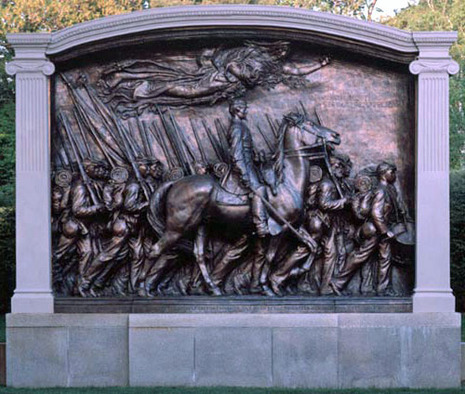 The 54th Massachusetts primarily was composed of free men. A number of the recruits were from states other than Massachusetts, with several coming from Pennsylvania and New York. Many of the Pennsylvania recruits were obtained in Philadelphia through the efforts of Lt. Col. Norwood Hallowell's brother, Edward N. Hallowell. Two of the recruits were sons of famed abolitionist Frederick Douglass. Soon afterwards, a second black regiment, the 55th Massachusetts, was organized and began training. Several officers initially slated for the 54th were further promoted for service in the 55th including, Lt. Col. Norwood P. Hallowell and the future brigade commander over the 54th Captain, later Colonel, Alfred S. Hartwell.